As you may remember, last week in the Cub Factor I mentioned that I was going to the game on Friday against the Phillies. And I did go and the Cubs won, because that's what they do. But something really struck me while I was down in Rickettsville. It was, Why bother? They are rebuilding everything so much in and around the park that there is kind of no point. Wouldn't they just be so much better off building something brand new in Schaumburg or Naperville, or wherever else in the area? The behemoth parking garage is just a huge monstrous "thing" that takes up so much of the old look of the place, it's like, why go through the trouble? I mean, it's huge, and only like 5% of the people going to the game are going to park there anyway. OK, I didn't really do the math, but it can't be that many fans, right? And then there's nothing you can do about some of the park, like getting in by the old (looking) marquee, which has fans waiting in line at the metal detectors and pouring into the street to do so. Yeah, that's safe. And then once you get in it's the same thing people have been saying for a couple years now with the expanded bleachers, enormous scoreboard and whatnot. I'm really trying to get away from being the old man telling you kids to keep getting off my lawn, but I guess that's just who I am these days. And full disclosure, I hate mowing the lawn and it is not even close to my thing. I do have to admit my buddy Kevin and I ran into a guy with a heavy Boston accent talking about his first walk up the stairs earlier that day and seeing Wrigley Field for the first time. The guy was close to tearing up just describing it. We guessed his name was Sully and/or Murphy. (Maybe it was Sullivan Murphy?) So yeah, the park still has a fantastic nostalgic "it" factor, but sheesh, I'm waiting for the troughs to have a sponsor. Week in Review: The Cubs went 6-1 for the week (and a day) and have won the last six in a row. So, yeah, so much for the slump. The Cubs will finish the month of May at 20 games over .500 regardless of what happens on Tuesday. So, we are back in the "The last time a team . . . " area for the Cubs. They are in rarified regular season air. Let's all take a good whiff. Week in Preview: The boys in blue stay home for the rest of the week with three more against the Dodgers and a weekend set with the D-backs. Somehow the Cubs play the Dodgers four times and don't see Clayton Kershaw. The dream season keeps rolling, I guess. Musical Outfielders: And no, we aren't talking about Matt Szczur playing the French horn. Jorge Soler continues to play like a major leaguer and had five starts in left this week. Szczur got one start and Kris Bryant got one as well in left. Soler even hit a homer off the scoreboard in left during the game I was at. I'd like to think he knew I was there and wanted me to shut the hell up. So I will. Solid week, Jorge. Four hits and four walks in 15 AB's, that'll do. Former Annoying Cub of the Week: I have to admit that I thought the Cubs signing Shane Victorino in the offseason was a solid idea. And it seems like the Cubs thought it was a solid idea to, if you listen to why they say as he is leaving. So it is annoying to me that he is now a former Cub. Seems to me there were other options on the roster to work with (see below). So Shane can't really be missed because we never really had him. But I miss the idea of him. Current Annoying Cub of the Week: Yeah, I'm still on the Tim Federowicz train. He's like the David Ross of the last couple years without the "fun old guy" stuff and "Lester whisperer" status. Ross, on the other hand, this season has looked better than capable both at the dish and behind the plate - and the Lester whispering seems to be working as well. So yeah, Tim, either get a gimmick or start hitting. Mad(don) Scientist: You aren't going to make Big Poppa Joe sweat when you use "lasers" to mark your defensive positions. 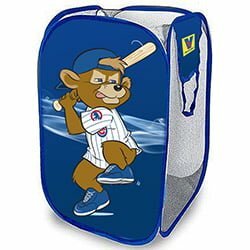 Kubs Kalender: Fans attending the Cubs-Diamondbacks game on Sunday will receive a Cubs Laundry Hamper depicting Clark the Cub. You'll have to put your dirty pants in a different hamper, because well, you know. Beachwood Sabermetrics: A complex algorithm performed by The Cub Factor staff using all historical data made available by Major League Baseball has determined that Schaumburg might have been better than Rickettsville.